The most common question on online kratom user forums is; what is the strongest kratom? Today, we’ll answer this question in detail to ensure you make the right choice when buying this potent product. We’ll start by looking at the strongest kratom strains and the areas that they perform extremely well. One of the reasons why people look for the strongest kratom is to find relief from painful conditions. 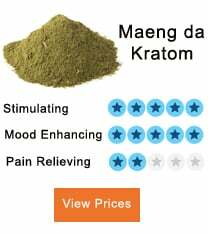 Potent kratom strains have enabled many people to live a pain-free life. Buyers can find the best painkillers by checking if they contain 7-hydroxymitragynine, which is a potent alkaloid than morphine. If you’re searching for the best kratom strains to relieve pain, you should check out Red Bali. It offers you effective pain relieving qualities and will ensure your body doesn’t have any pain feelings. Strains such as Indo and Maeng Da may not be as potent as Red Bali, but will still provide you with pain relief. If you are looking for moderate pain relief, you should consider using Malaysian kratom. It’s ideal for daily use. Kratom extracts are ideal for relieving intense pain when compared to regular powder. Do you want to uplift your mood? The Green Malay strain is the perfect answer for you. It’s one of the strongest types of kratom that will enhance your mood. On the other hand, you can also opt for Maeng Da since if offers you a mixture of alkaloids. Users who dislike Maeng ad should consider trying out Bali. It boosts the user’s mood better, but only if the source is right. Mixing red Borneo with Thai can make you experience a euphoric feeling, which may be the reason you’re searching for the best kratom. Users looking for highly sedating kratom strains should try the Red Bali, which is full of 7-hydroxymitragynine. You’ll fall and stay asleep easily since this strain works by calming your mind. However, waking up in the morning can be difficult after spending long hours sleeping, but if you want mild sedation, you should use Borneo, in this case, Borneo. If you want to get opiate high, the best strain to use is Red Bali. Most kratom users love using this product to prevent fatigue and increase their bodies energy. 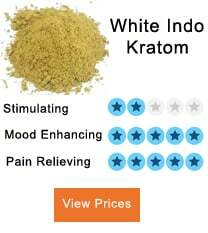 The best strain to use is the White vein kratom. You will find it easy to quit caffeine by opting to take white Maeng Da or the ultra one when you need to boost your energy. Users can also use a kratom alternative, which works better for energy boosting needs, but nothing beats the strongest kratom. In the case you want to use Maeng Da, you should use Thai, which provides you with stimulating needs. Avoid using larger doses to prevent your body from becoming tolerant. Now that you the strains that work well for the above four situations, let’s look at them in detail. 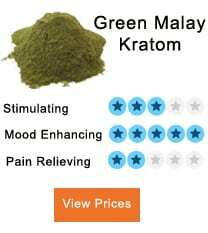 The Green Malay kratom strain offers you an energizing scent and is potent. You will get a relaxing feeling the more you consume it. One fantastic reason why you should take green Malay is that its effects can last for almost 8 hours if you buy it from the right source. It may be strong, but users take it if they want to quit kratom. 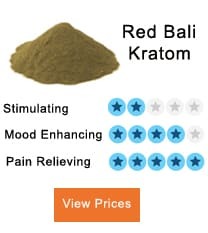 Red Bali Kratom is a sedative and potent strain which is recommended for people with pain conditions or opioid addiction, meaning its among the strongest kratom. It contains at least 25-30 or more alkaloids. Two of these work with each other and ensure this strain is the best option for relieving pain. The 7-hydroxymitragynine alkaloid is extremely potent and has 13 times more pain reliving potency than morphine and 46 times higher when you compare it with standard mitragynine. The red Bali combines 7-hydroxymitragynine with 9-Hydroxycorynantheidine to give it another effect of relaxation and pain relief. Compared with Red Vein Thai, Red Bali is more potent. 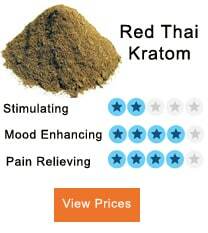 On the other hand, red Thai offers you more stimulating effects and fewer side effects. The green strain offers users stimulating and euphoric effects, meaning its another strong strain. However, when you compare these effects of the green vein, you will find them less useful than other strains. This strain provides users with long-lasting results, for example, the Green Malaysian Kratom. Users prefer this strain for pain relief since it doesn’t result in drowsiness. Others also use for treating social anxiety. The red vein strain provides users with a relaxing and sedating feeling, meaning it can produce the effects of opioid. With its euphoric color, it’s well known for its pain relieving and relaxing effects. This strain contains lots of 7-hydroxymitragynine, which is an alkaloid that provides you with stress and pain relief. UEMD is among the most active strains of kratom, which is got from ancient grafting. Maeng Da contains more flavonoids and alkaloids when you compare it with the gentle strains. It won’t make you feel uncomfortable or sweat, and it’s the reason why it’s referred to as a clean stimulant. Maeng Da contains additional and pure alkaloids, hence its name. Green Borneo is a strong strain of kratom. The green vein Kratom offers users a stable boost and mood, and similar to red Bali, Green Borneo kratom is full of potent alkaloids, making it a potent painkiller. Users looking for a more relaxed and sedative feeling should opt for red Bali. On the other hand, if you want effective pain relief and energy during the day, you should choose green Borneo. 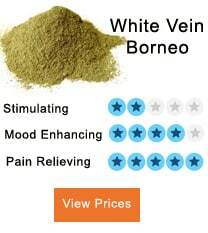 The white vein strain acts an effective stimulant, boosts your energy, and improves concentration. Users find it the best substitute for coffee/caffeine since it promotes mental activity and wakefulness. Also, it helps you fight fatigue and offers you motivation. It’s ideal for users who carry out tasks that need you to be mentally alert. The best time to use it is in the morning to avoid getting insomnia. It’s important to keep in mind that our bodies differently react when using any product, including kratom strains. It’s the reason why you should use sample packs when trying out the strongest kratom strains for the first time. Fortunately, the above strains are stable, meaning you won’t be disappointed. Remember how you consume your kratom makes a huge difference when it comes to potency.